You'll appreciate a quick setup at your next event, indoors or outdoors, with Summit Racing® folding canvas tables. These 24 in. tall, 28 in. diameter round tables have a sturdy canvas top with four mesh cup holder pockets—and feature a sturdy frame that folds and unfolds in a flash! 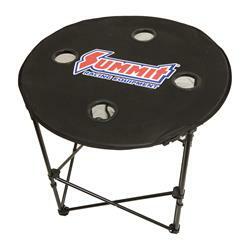 Summit® canvas tables keep your favorite snacks and beverages right where you can reach them. They're great for a card game, extra seating for large gatherings … just about any reason for a convenient "pop up" table! A handy storage bag is included. really nice table. We like how it has it's own carrying bag for portability at car shows. Pleasantly surprised at how tight the top is and the great support it has. convenient good price will use it at car shows. Folds flat for storage, Love it.